Bus stops are generally located at intersections where they may be placed on the immediately before or after an intersection. Bus stops should be placed as close as possible to a safe crosswalk to allow people to safely access the stop from both sides of the street. In certain cases mid-block stops are considered. 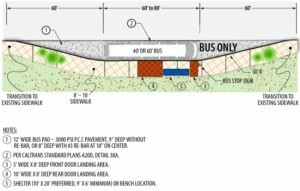 Enhanced Bus stops - The design of bus stop waiting areas and the provision of amenities that enhance security and comfort play a significant role in a person’s decision to use transit. 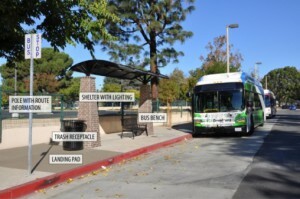 Passenger amenities are installed at selected bus stops to improve passenger comfort and the relative attractiveness of transit as a transportation alternative. sbX stations provide passengers a first impression of the sbX service and are designed to be similar to light-rail stations, and provide quicker on and off boarding of passengers. 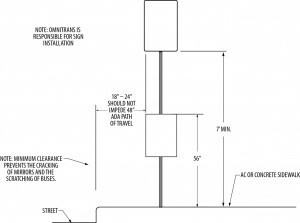 These design guidelines and criteria have been developed using the following overall design objectives for stations. Potential local bus stop locations or concerns regarding existing stops may originate from city staff, Omnitrans staff, passengers or the general public. These requests include issues, such as requests to add, move, or remove bus stops or bus service; add, move, or remove amenities at existing bus stops; and operational or safety/security issues related to the stop location. Bus Turnouts - A Bus turnout is a short length of roadway that has been widened to allow for buses to reach a bus stop without blocking the curb side travel lane. Bus Bulbouts - Bus bulbouts, also known as nubs or curb extensions, solve the problem of locating bus patron amenities in dense urban environments with considerable pedestrian traffic. Bus Pads - Roadway pavement (or shoulders, if that is where the buses stop) must be of sufficient strength to accommodate repetitive bus axle loads of up to 25,000 pounds. sbX Running Ways - The sbX vehicles operate in running ways, which serve as the major determining factor in the speed, reliability, and total cost of a BRT system. Queue Jumpers - Delay at intersections from queuing vehicles detrimentally impacts bus performance.